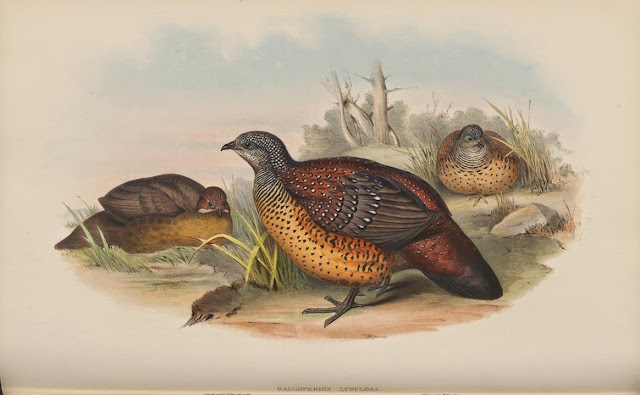 In the 1800's naturalists used their scientific knowledge to draw birds with great detail. 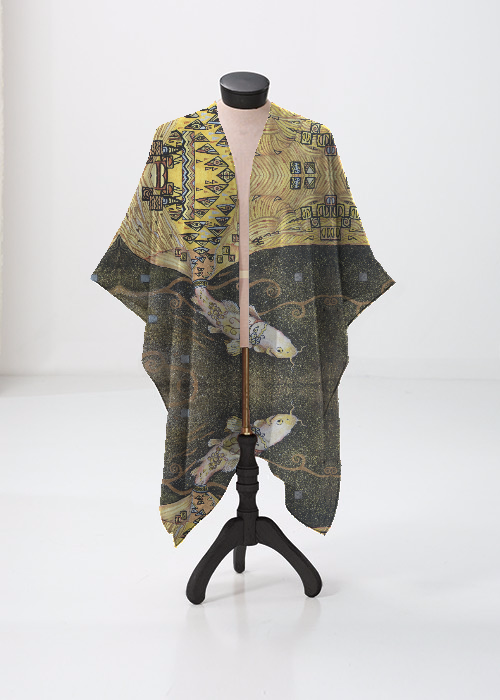 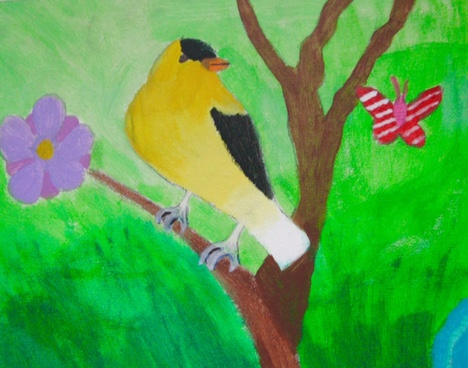 If I taught my students to observe like naturalists would it make them better artists? 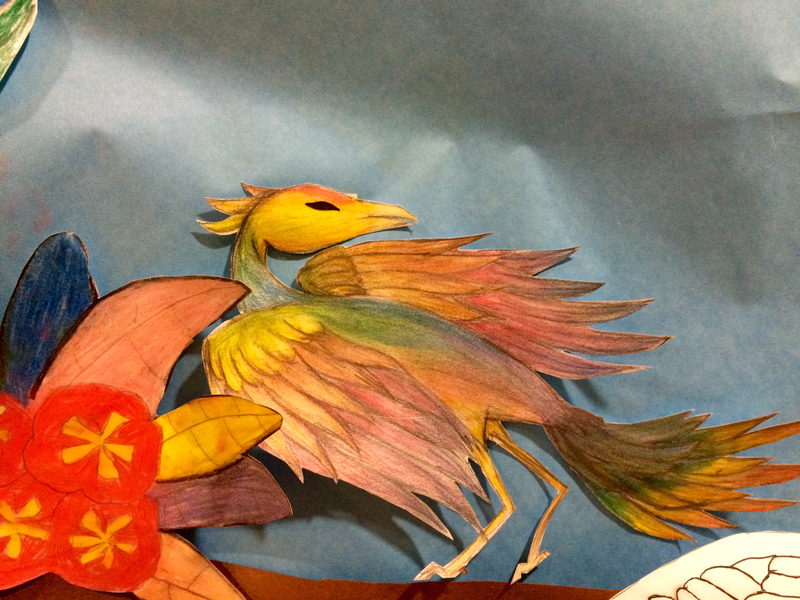 The answer turned out to be yes. 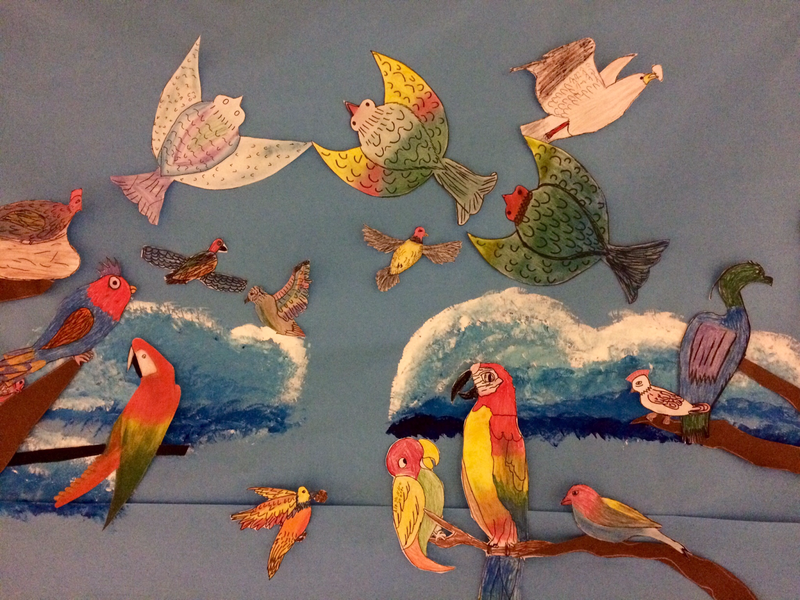 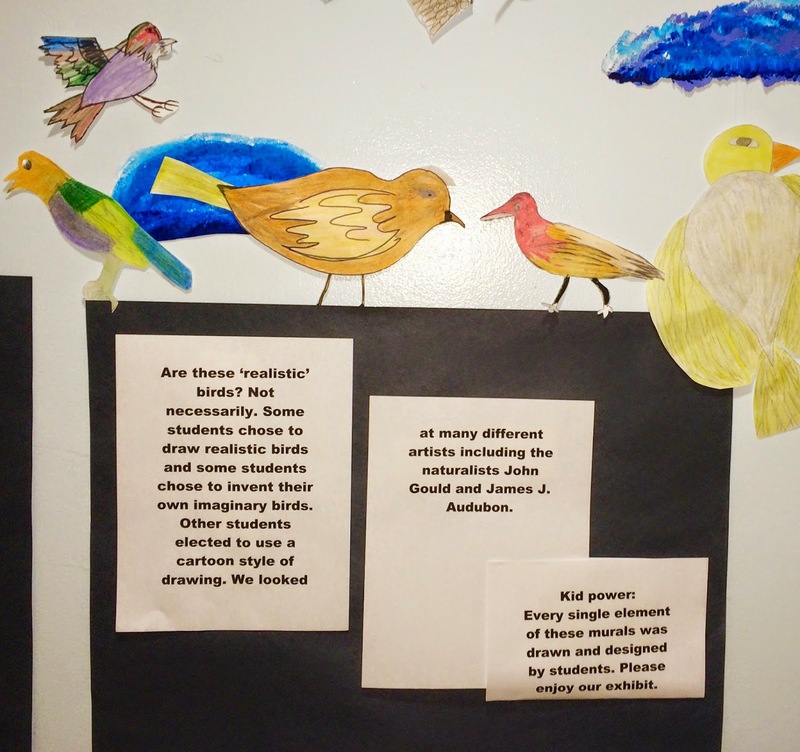 Each one of my students drew a bird and cut it out for our 'Draw a Bird Day' group mural project. 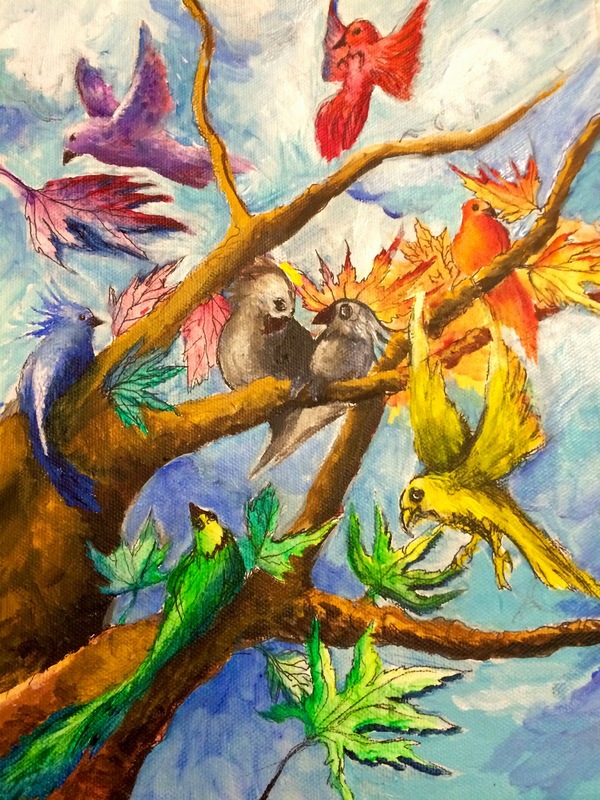 I started out by video taping birds in pet stores, taking a walk outside with binoculars and photographing my father in law's pet parrots. 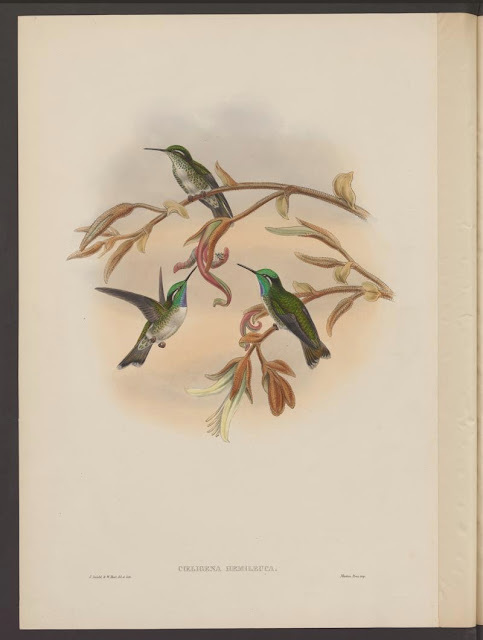 In addition to looking at my photographs and videos, my students and I examined bird paintings by the naturalist artists John Gould (1804-1881) and John J. Audubon (1785–1851) in the hopes of observing the common characteristics of all flying birds. 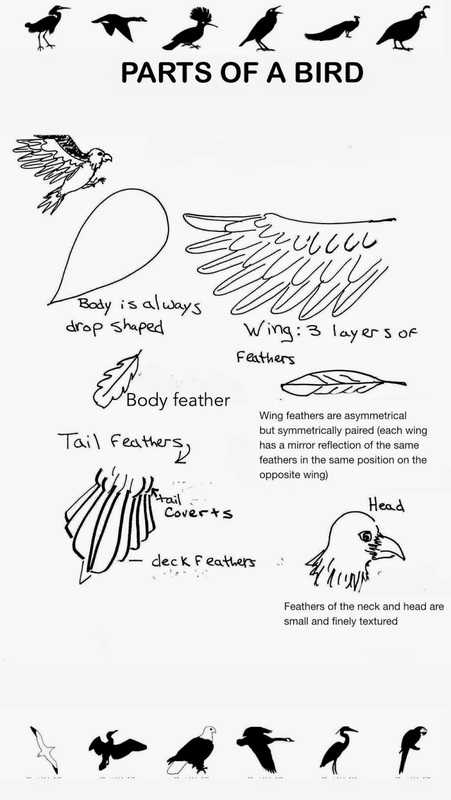 Students were given the option of inventing their own imaginary birds, drawing realistic birds, or creating whimsical cartoon birds, using the guidelines on the worksheet above. 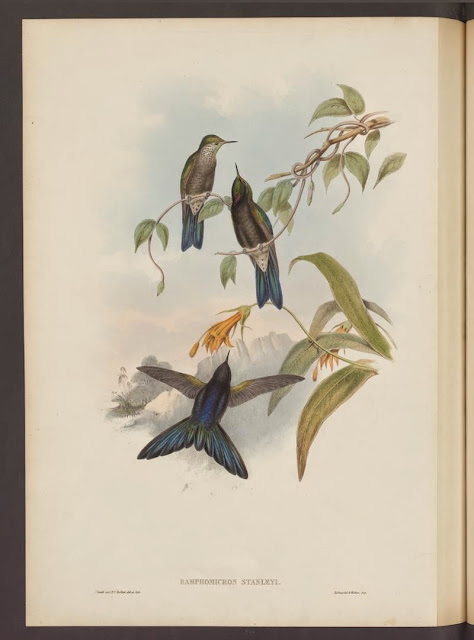 They were able to use the iPads in our classroom to look at John J. Audubon's classic book, 'Birds of America' and John Gould's stunning bird illustrations. 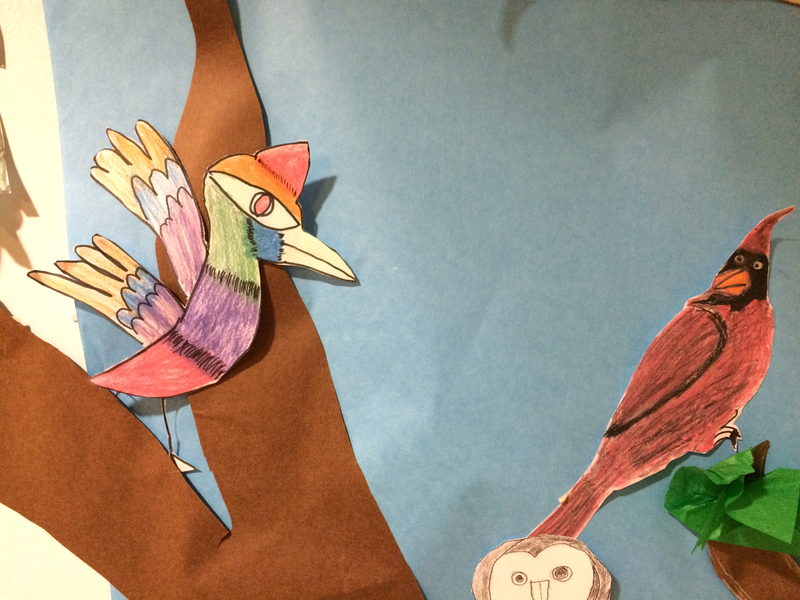 Most students elected to invent their own birds and color them in a whimsical fashion. I created this time lapse video on my cell phone to demonstrate how students can use their new found knowledge to create their own birds. 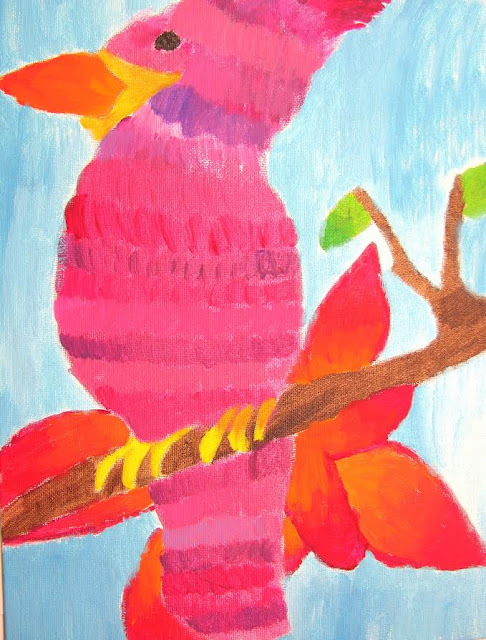 and encouraged them to experiment with blending colors. 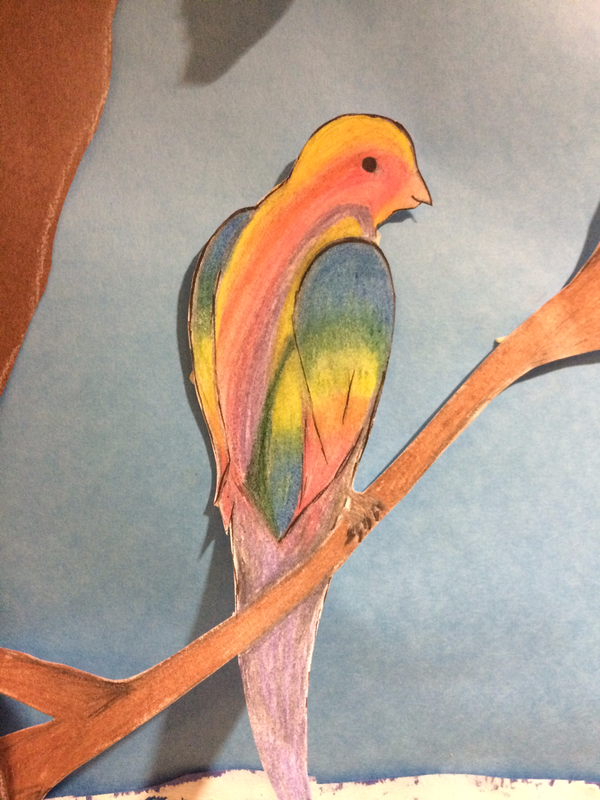 Since we would be cutting our pictures out, they were free to experiment with color combinations on the rest of the paper before deciding how to complete their birds. We used pastels and mixed the colors with tissue paper. 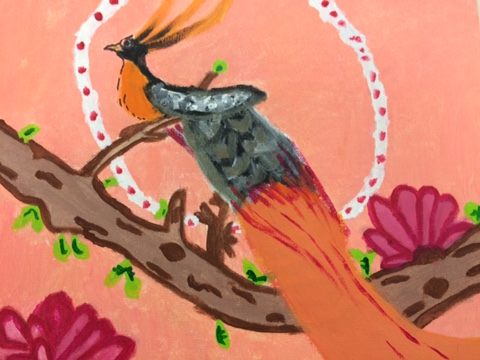 I created a time lapse video using iMovie on my cell phone to demonstrate how to follow the direction of the bird's feathers and how to layer and blend the pastels. 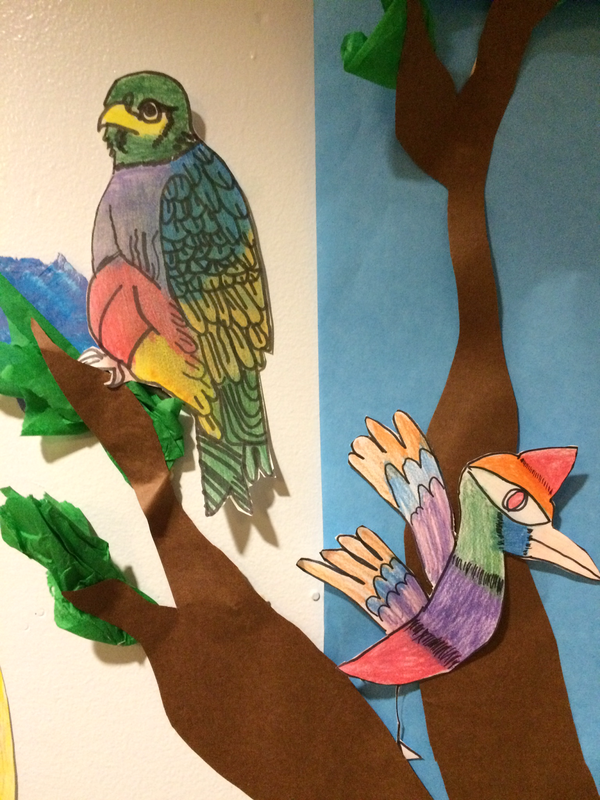 As the students cut their birds out, I collected them in pocket folders to keep them safe. 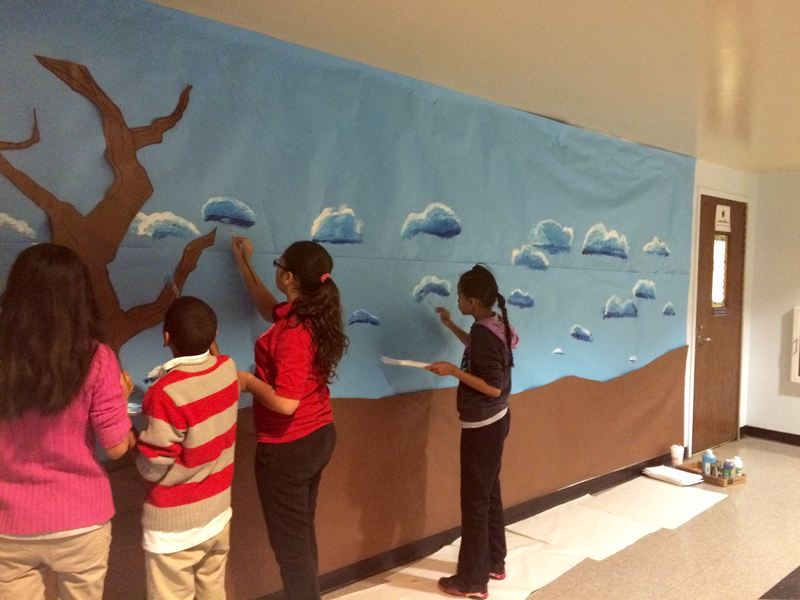 My sixth graders used fan brushes and acrylic paint to create clouds after I hung blue paper in the hall way. 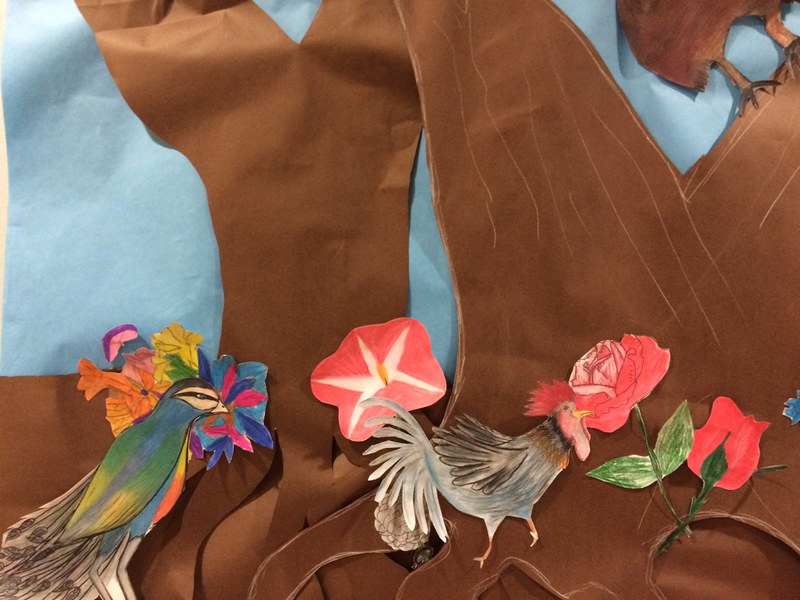 My 8th graders created giant trees to add to the mural and my 7th graders added grass. 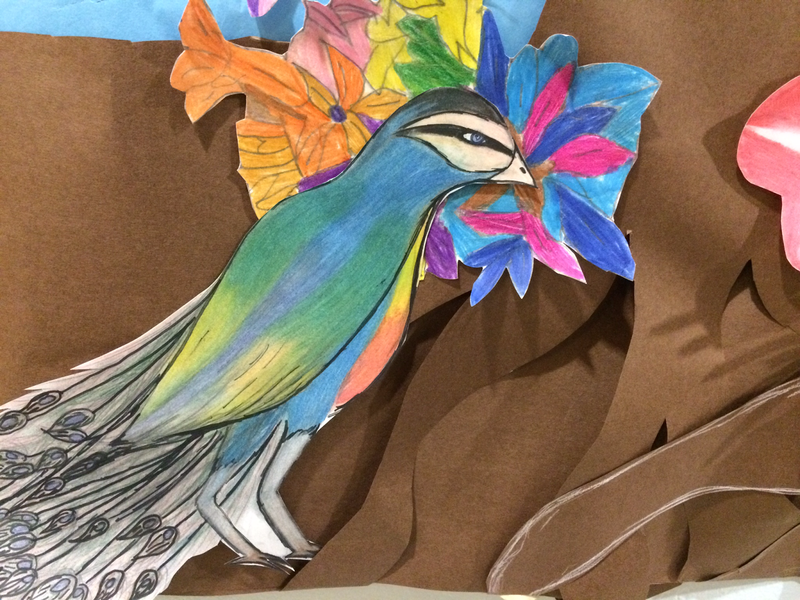 Early finishers in every class created flowers to create a beautiful environment for our birds to land. 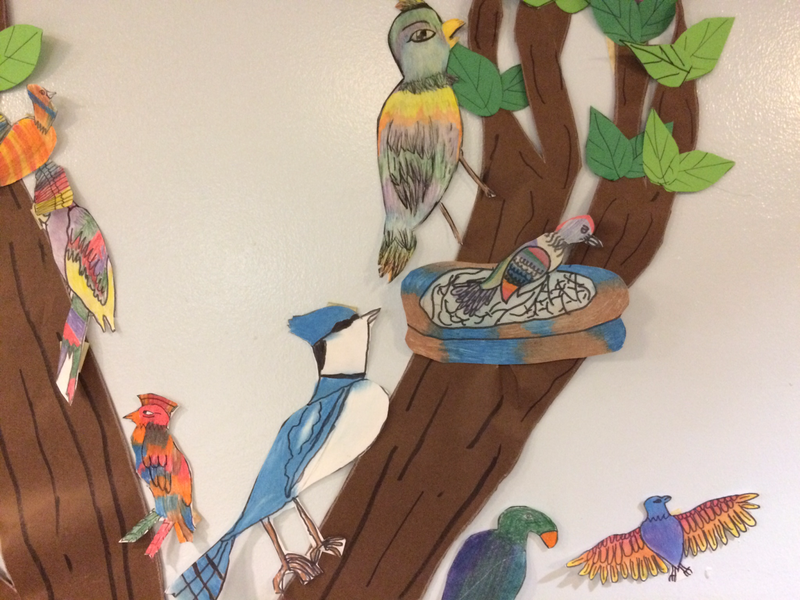 We were all set for the spring bird migration. 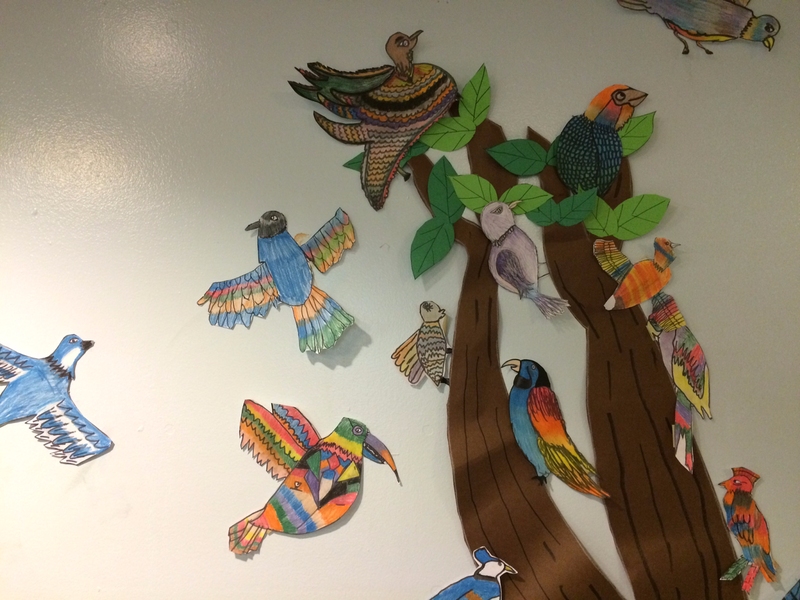 We hung our murals in the hallway near the cafeteria to insure that the whole school had a chance to enjoy the artwork. 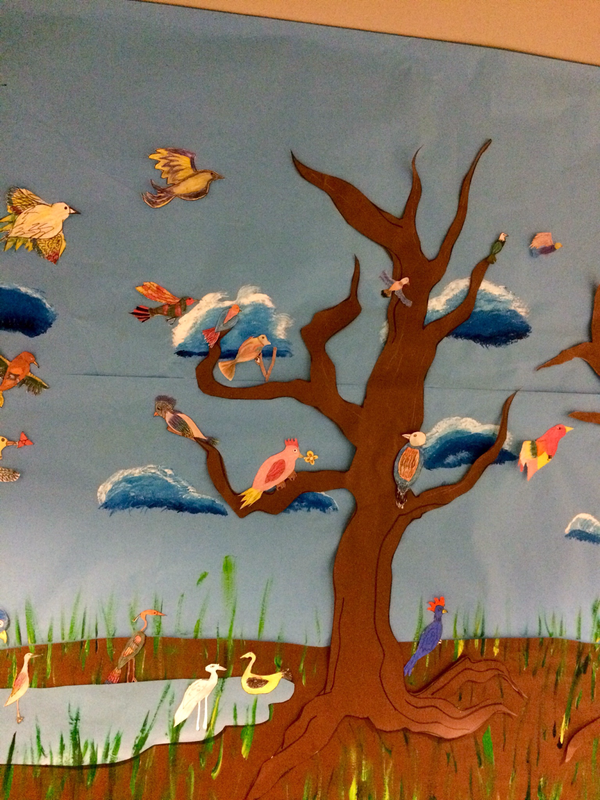 Several 6th graders gave up their recess in order to hang the trees and birds using loops of masking tape. 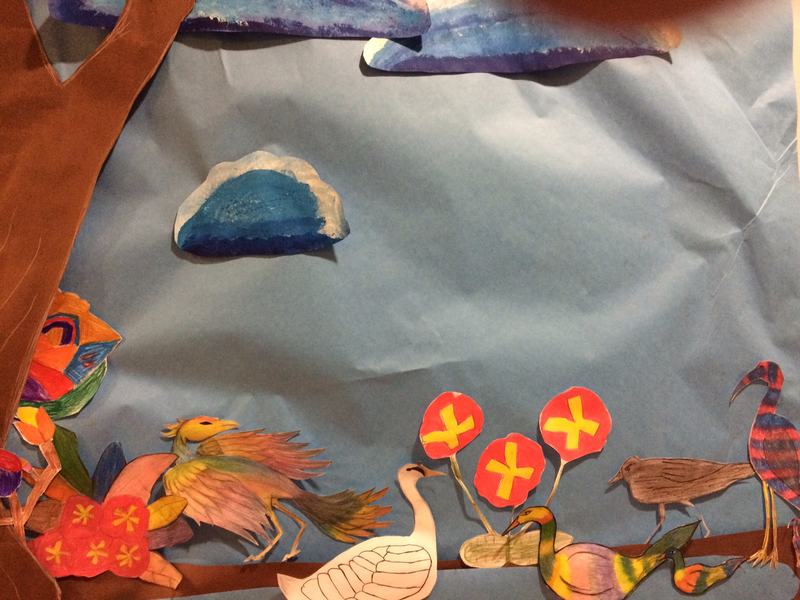 My only rule was that everyone's artwork had to be included. 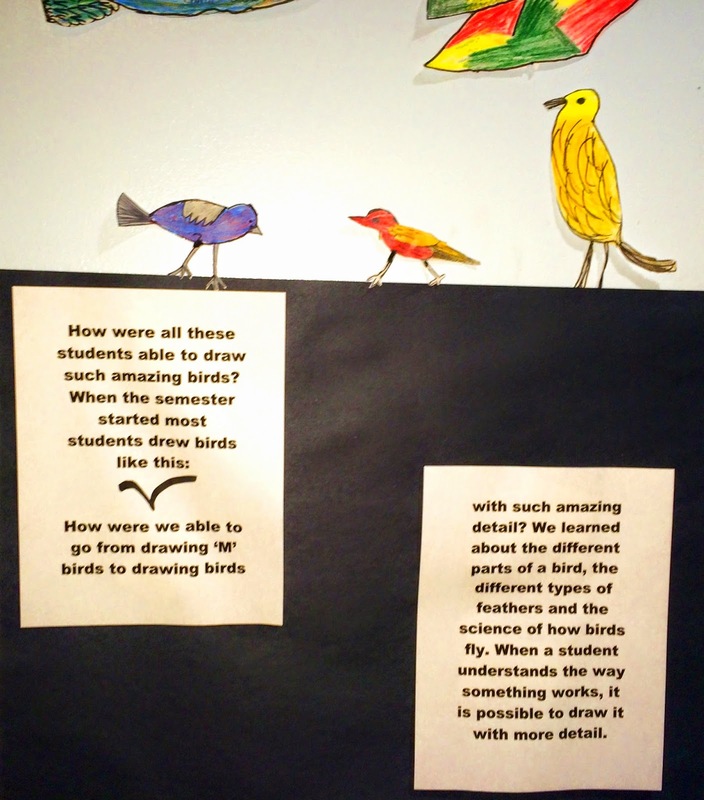 Finally, I typed up an explanation of our project and hung it in the corridor where it became a handy spot for our birds to rest from their long migration. 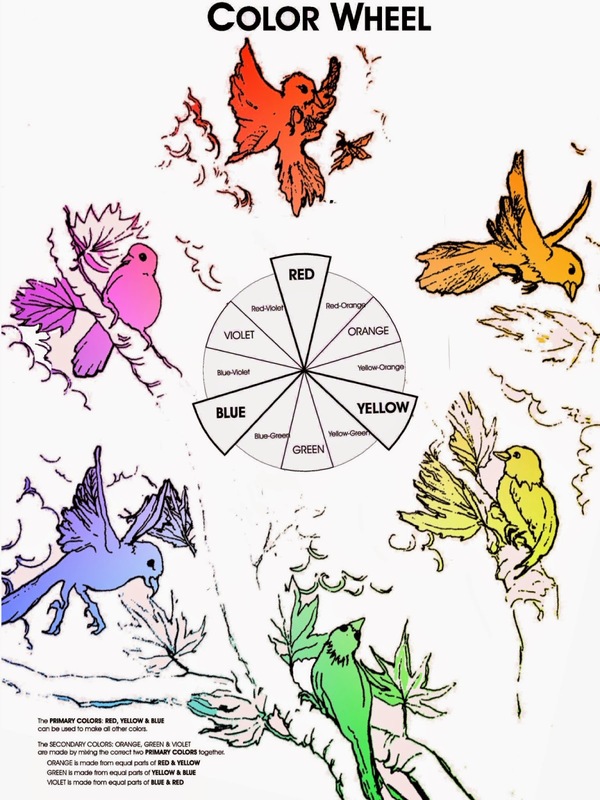 I retaught this lesson again to 6th, 7th and 8th graders at Samuel E. Shull School in April of 2016. 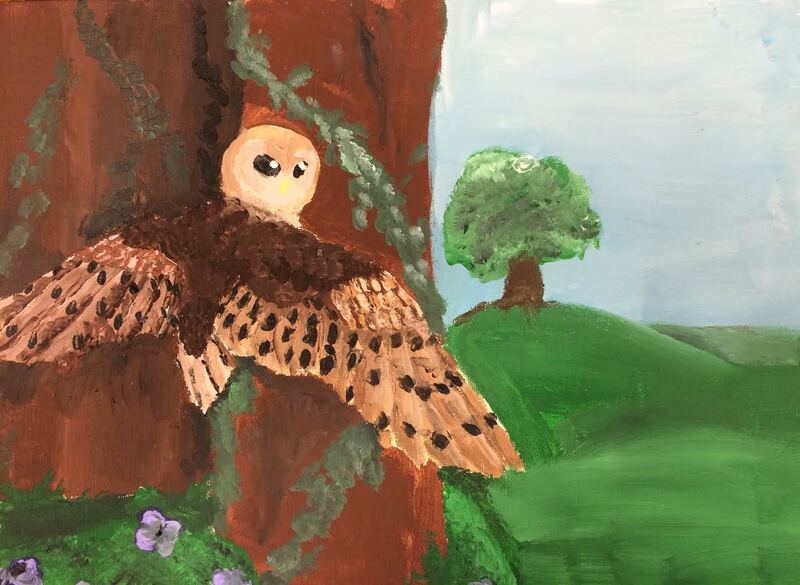 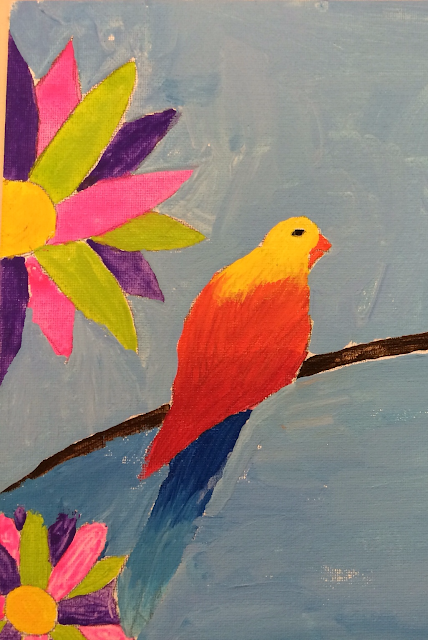 This time the students used acrylic paint and canvas board to create their birds. 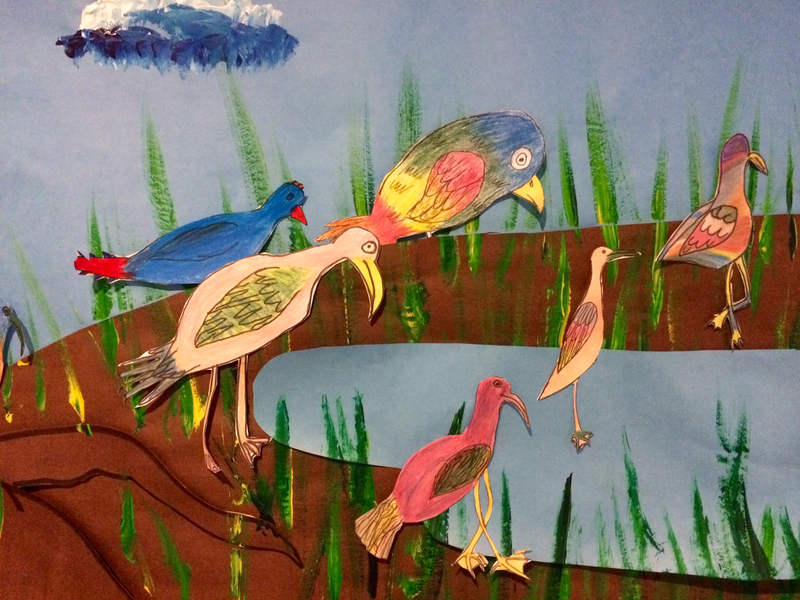 Who was John Gould and how did he inspire my students? 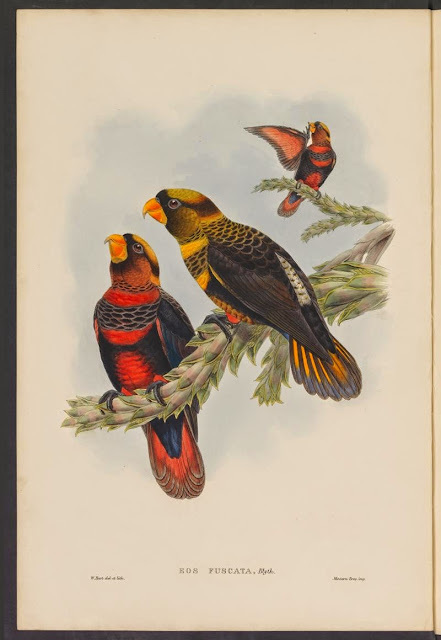 All of Gould's books and drawings are in the public domain and available for free on the Internet. 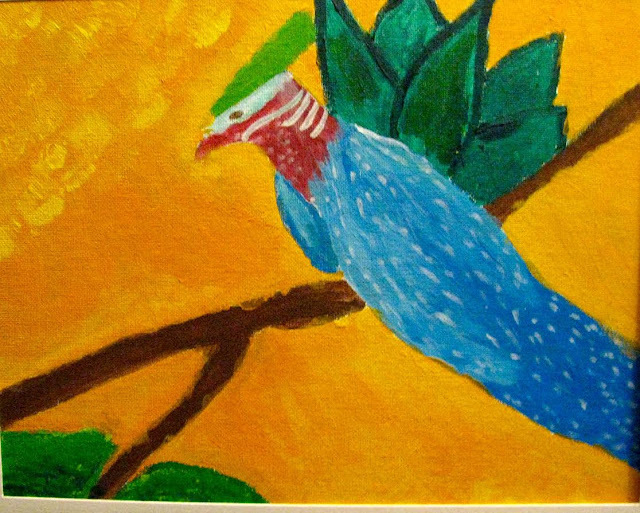 On Painting Birds, by clicking here. 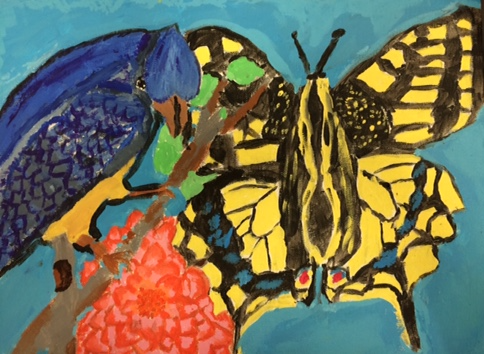 Your students' works are stunning. 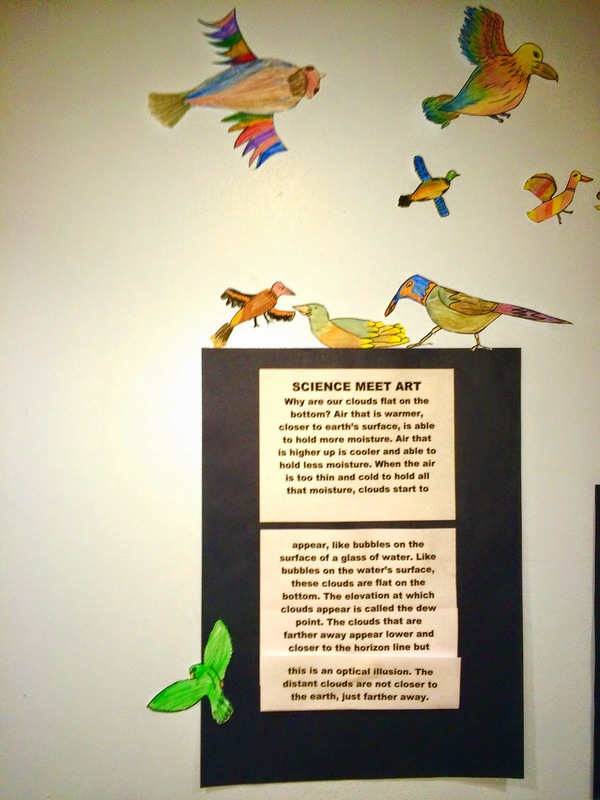 I love how you had scaffolded their learning.